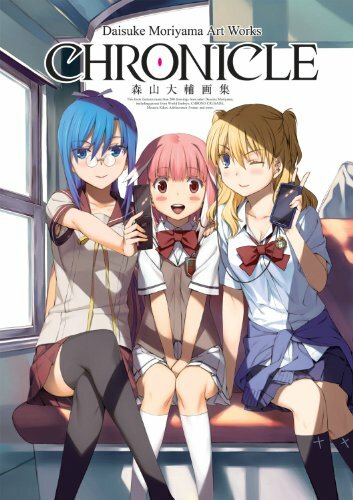 Daisuke Moriyama Art Works: Chronicle is the English translated edition of the original Japanese artbook 森山大輔画集 CHRONICLE that was released in 2012. Udon managed to get it out in English slightly more than a year, and that's quite impressive. This 208-page paperback collects almost 20 years of artworks. There are over 200 drawings. Some of the earlier illustrations were created in 1994 & 1995 for RPG Magazine. His more notable works such as Chrono Crusade (クロノ クルセイド) and World Embryo (ワールドエンブリオ) came out in 1999 and 2005 respectively. Other titles with more artworks included are Ten Takaku, Kumo wa Nagare (天高く、雲は流れ), Bancho Gakuen!! (Bancho Fight!! ), Monster Collection Trading Card Game, and others. The artworks are beautiful. You can see that the earlier works were created with traditional medium, and the more recent ones seem digitally painted, such as the one on the cover. It's full colour throughout. The colouring style is more manga than anime as Daisuke Moriyama is a manga artist. Captions for the drawings appear at the back and it's not easy to refer back to the main pages because the page numbers are not visible. Not all illustrations have captions so if you're unfamiliar with the work, the characters may seem foreign. Overall, it's a great artbook recommended to fans of Daisuke Moriyama.